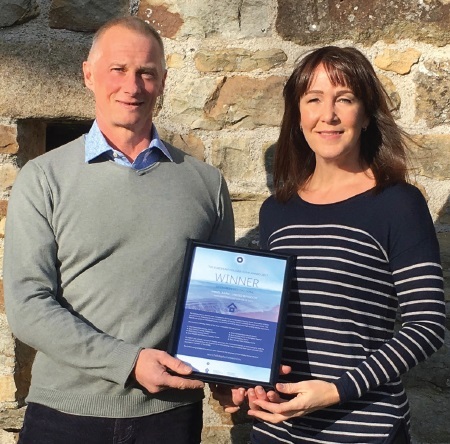 A couple’s vision to create a luxury holiday home business out of a dilapidated farm has been rewarded with a major European tourism award. When Richard and Debbie Greaves first set eyes on the run-down tenant farm near Ravenstonedale they did not see the ramshackle buildings that had led so many others to dismiss the property, but instead saw the potential to create a beautiful base for holidays between the Yorkshire Dales and Lake District. Now after 12 years of renovations their hard work and skill in creating such stylish retreats has been honoured with an award from the European Holiday Home Association. Click here to see how they created A Corner of Eden. Richard recalls that they had spent over 12 months devoting weekends looking for a property to start a holiday home business and had all but given up on the idea when they chanced upon an article in the local press about a Georgian farmhouse up for auction. “It wasn’t in the area we had been looking in and there were all kinds of reasons why it should have been a non-starter, but we arranged a viewing and by the time we had reached the front gate I had fallen in love with it, bought it, converted it and retired - but maybe that’s how my mind works,” he said. “It was in a fairly sorry state, but all I could see was the potential and the joy of bringing it back to life and being a naive optimist I thought we will be able to do that in a couple of years - 12 years on and we’re just about finished,” he added. Thankfully it was a vision shared not just by Debbie and their friends and family who were to lend a hand with renovation work, but also the Cumberland Building Society who agreed to step in and provide the finance so the couple could go to the auction with a chance of making their dream a reality. “In fact the chap from the Cumberland came in to the auction and I thought that was a fantastic gesture, to come and support us, wish us luck and help us with the deposit once we were successful. “It says something about the personal touch which gave us an incredible feeling of support,” Richard said. Their faith in backing Richard and Debbie has paid off as the couple now have a successful holiday let business. Find out if The Cumberland could help you finance your holiday let dream. The Farmhouse sleeps eight, Angel Barn with a wood fired hot tub can accommodate six and the Shepherd’s Cottage is designed as a couple’s retreat complete with an outside bath. The properties now enjoy high levels of occupancy all year round. Together they are promoted as A Corner of Eden and each has been designed to the highest spec, working with as many of the original features as possible, but it is Angel Barn in particular that has landed Richard, 53, and Debbie, 42 their prestigious European award as the Best Green Holiday Home. It has a ground source heat pump, solar panels and is insulated using a sheep’s wool product supplied by Penrith-based Thermafleece. The couple have always chosen locally produced products whenever possible. It has been quite a journey for Richard and Debbie and much of the initial building work was juggled alongside their work at Impact International where Debbie was a Training Co-ordinator and Richard was European manager, flying off to set up a new office on the continent one day and back to help lay a new floor or knock down a wall the next. Now Richard has stepped back from that role and he is hoping to enjoy the fruits of their labour for a while - until they get their next idea on how to improve A Corner of Eden. Over the years many banks and building societies have touted for their business, but Richard has remained loyal to the Cumberland not least because of the faith they have shown in him from the start and the support for the business going over the years. “We developed a relationship with the Cumberland when they were kind enough to give me a mortgage to convert a barn, back in 1996, and that continued when it came to A Corner of Eden. The success of A Corner of Eden has always been based on strong personal relationships with guests and suppliers and their experience with the Cumberland has been no exception.